Combine texture, functionality, and style! Easily coordinate Bloomsbury curtains with your child's favorite bedding for a fresh look.With a room darkening design, these casual style window panels feature a floral print and block unwanted light for a restful night's sleep and added privacy. Perfect for your preteen or teen room, the heavy weight curtain panels are constructed of polyester Micro-Sculpt fabric giving the panel a textured feel and lined with a polyester room darkening liner. 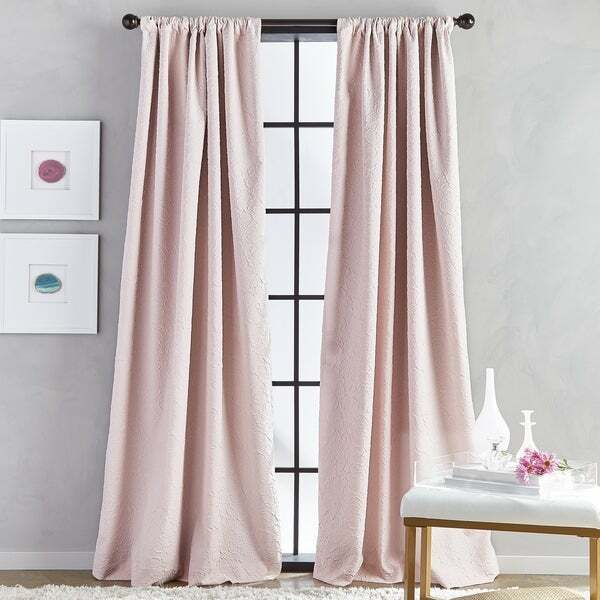 Curtain panels are machine washable for easy care.Each curtain features a 3-inch rod pocket to accommodate either a standard or decorative drapery rod. Single panel measures a generous 52 inches wide. Panel is sold individually. Dimensions 95.0 In. X 52.0 In. X 1.0 In. Very pretty, soft pink. Really like them. The panels are wide enough, I ended up only needing two panels, instead of the 4 that I bought. "Is this one or two panels?" This is a single panel.